Frequently cited by the courts, New York Criminal Law provides a comprehensive guide to the New York State Penal Law by analyzing each offense and discussing the interpretive caselaw. This treatise examines unresolved issues of statutory construction and constitutional issues. It gives prosecutors and defense attorneys alike a basis for arguing what the current law is and how it should be interpreted, and judges can also benefit from the thorough analysis. 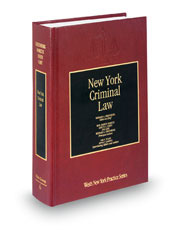 This volume offers a solid basis for any legal professional’s research into New York substantive criminal law matters. This edition covers additional subjects, such as the law of sentencing. It reveals and highlights the tension between the legislative and judicial functions. Every article in the Penal Law is addressed, analyzed, and annotated. The book details the facts of each cited case and identifies open issues of statutory and constitutional interpretation. SEC Closes its Investigation of Copernic Inc.